You can’t really call it a comeback. The Hyundai Tucson never had a summit from which to fall. Rather, it spent the last decade traversing a plateau of mediocrity. But early indications are that the 2016 the Tucson breaks free of that cycle, joining the lead pack among the crowded herd of small SUVs. 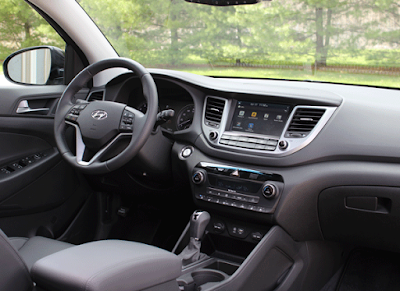 Hyundai wipes the slate clean with the 2016 Tucson. Anonymous styling is replaced with a well-defined aesthetic, announcing just how far this five-passenger SUV has come. For one, Hyundai has learned a thing or two about space management. Despite being only two and a half inches longer and less than an inch wider than the outgoing Tucson, the cabin space has grown. Passengers over six-foot-two can sit behind a like-sized driver without fear of knee pain, and head room is plentiful. 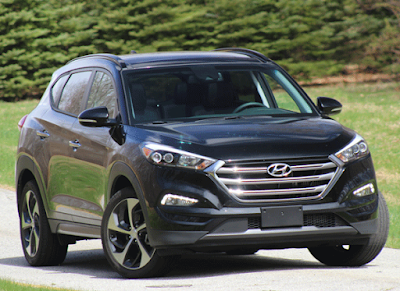 We borrowed two different Tucson’s from Hyundai–a base model and a Limited with the Ultimate package. One of our staff members called the base version “the best ‘Plain Jane’ car out there,” thanks to its simple and intuitive controls that never felt basic. The base 164-hp, 2.0-liter four-cylinder gets a conventional six-speed automatic. At the risk of causing confusion, the Limited trim actually gets a smaller, 1.6-liter engine. With the help of turbocharging, this unit makes 175 horsepower, sent through a seven-speed dual clutch transmission, or DCT. Rather than moving to a continuously variable transmission, like many Japanese manufacturers, Hyundai is taking an European-like approach with an automated manual and small-displacement turbo combination. While built on different platforms, the new Tucson comes across as smaller Santa Fe by virtue of its substantial feel and impressive interior fit and finish. In particular, the top-end Tucson Limited calls into question the existence of the Santa Fe Sport in Hyundai’s lineup. Our press version came with the Ultimate package, which included a massive sunroof, hands-free power tailgate, heated and ventilated front seats, and an eight-inch touch screen. Some automakers have infotainment systems that make it a struggle just to change the radio station, but Hyundai’s digital layout is mercifully logical. We’re hard pressed to think of any other car in this segment that offers as much as the loaded up Tucson, and we suspect you’ll get it all for a competitive price. “Suspect” because pricing for the Tucson has not yet been disclosed, but Hyundai claims it would not be much more than the outgoing model. That could mean a base price of around $22,000, a mid-pack SE with popular equipment for around $27,000, and a Limited for around $32,000. The substantial feel and mature styling give the 2016 Tucson strengths that could shake up the small SUV market. It has grown up in many ways and while we’re far from knowing how it will rank among the pack of small SUVs, the 2016 Tucson has made a strong first impression.